My son has been extremely lucky to have 3 and half years of excellent teaching from his teachers, and I could not have asked for more from any of them. Anyone observing his engagement with reading, now aged 8 years, who rightly come to the conclusion that not only can he read, that he is a child who want to read and when he finds the right book he clearly takes pleasure from doing so. Some people may also assume that he was always going to be a ‘reader’. However, I believe that there were a few significant things that happened in school and at home in his first two years of school, which laid the foundations which made it possible for him to become the reader he is today. When my son was in reception, he very much liked routine, and this was something his reception teacher clearly understood. So when it came to talking about the transition to year 1. She made sure that my son’s new teacher had some similar routines to her. What was interesting was the similarity in those routines, concerned the way books were used at the beginning and end of each day. What I only realised much later was that same routine’s that had enabled my son to feel comfortable with school, to connect to school and to build connections with other children had together with regular reading aloud at home been fundamental in laying the foundations for reading for pleasure. When my son started school, he had a few favourite books, including a book on recycling (which was aimed at older kids). He was however often more interested in watching Number Jacks or telling us all about recycling or the planets in space than he was listening to a story. He could not hold a pencil, and when he started he had little knowledge of phonics. However, thanks to the support of his brilliant reception teacher and some of his new friends he was able to adapt to life in school. The teaching of phonics was very good and this combined with us signing him up at home for Reading Eggs, meant he made steady progress with his phonics. Before, long he said: ‘mummy it’s just like maths there is a code to crack’. But, this isn’t a blog post about the teaching of reading skills or literacy in the early years. It’s about how a partnership of school and home, which consistently prioritised reading aloud and ‘informal’ regular spaces to share and enjoy books, won a boy round that wasn’t yet (when he started school) entirely convinced that stories were relevant to him. Both his reception and year 1 teacher started their school day in the same way. With books next to the children where they sat. For reception this was books on the carpet. On my son’s first day his teacher made sure he had a book on recycling next to the place where he was to sit. I could have hugged her! In year 1, his teacher had a book shelf from which children could select their books at the start of the day. One of my son’s favourite books was Miles Kelly’s 100 Facts About Planet Earth. He and a few other kids in his class spent weeks looking over that book. Several of the children in his year 1 and 2 class brought in their own books to share. This worked really well for my son as one of the older kids loved non-fiction and brought some of those to share. Both teachers read a story aloud at the same time in the afternoon most days. Which meant my son knew for two consecutive years, that that time of day was story-time. About Easter of reception the topic was: things that grow. One of his favourite books at the time was: ‘What’s This? – a seed’s story’, published by Barefoot Books. I gave a copy to his teacher who shared it in story-time. We continued this into year 1. I was bit nervous about what he was going to make of a dinosaur topic, as he has never shown the slightest bit of interest in them. In the summer holidays after reception he had really enjoyed being read the Mr Men books (drawn to them initially as they were numbered on the side and all ordered in a case). I found a book called: ‘Mr Men Adventures with Dinosaurs’ and gave a copy to his year 1 teacher, so she could share it at story-time and he could look at it with his friends. For two consecutive years (reception to end year 1) we read picture books aloud most nights to my son and his sister (who was two and half year’s older). This was as well as the book they read themselves. In reception two of my son’s favourite books to have read aloud were: ‘Wendel and the Robot’, by Chris Riddell, and ‘Boy who turned off the Sun’, by Paul Brown. When my son was in year 1, they started to develop books in common that they both loved. Both children have always been very particular about the books they like, so it was fascinating to see which books they both enjoyed. These included: ‘Errol the Squirrel’ by Hannah Shaw, and ‘The Day the Crayon’s Quit’. I have blogged about some of them here. 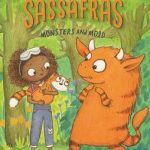 Had my daughter not had such a challenging year 3 (year my son was in reception) it is possible she would have stopped being interested in being read picture books earlier. 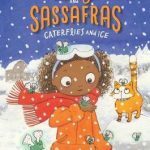 But, sharing picture books together at home is something I think they both have hugely benefited from, and which I would highly recommend to any family. There was of course so much more each of his teachers did, we did, and my son did to get him to where he is now with his reading. But, with the benefit of hindsight I firmly believe that it was these relatively simple things, repeated consistently over several years, that convinced my son that reading could be meaningful to him. However, as I had already discovered a few years earlier with his sister, making good reading progress and enjoying being read stories aloud is not a guarantee that a child is going to successfully make the transition from school readers to independent reading. However, it does make it more likely! He did go through a wobbly phase with his reading from June of year 1 to November of year 2. And I wasn’t quite sure which way things were going to go. But, at that time I had not understood as clearly as I do now the importance of ‘reading communities ‘in developing readers, and that they can come in all sorts of shapes and sizes. Had I understand this I may not have been so nervous, about whether he would be able to negotiate the next stage in his reading journey. We were also lucky in the summer of 2017 to find in a relatively short space of time three book that really meant something to my son, that he read to us. Two of which were almost accidental finds, and one of which (the coding book) was given to my kids by his Yorkshire granddad. 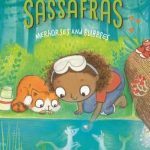 Promoted by a number of bookish discussions I have had on twitter recently (you will find me @melissacreate15), I have been reminded just how great reading aloud to my kids has been and continues to be, and how it is about far more than sharing stories, it’s also about sharing timing together, and creating memories. I started reading aloud to my daughter every night when she was 10 months old, each night she would choose 3 book for myself or my husband to read to her. It was and still is one of my favourite times of day. When I was pregnant with her brother I was often tired and we would cuddle up on the sofa on my days off from work and listen to her favourite Barefoot Books sing along ‘The Journey Home from Grandpa’s’ and in the run up to Christmas we had a great Christmas carols CD which you could follow along with a book. We continued reading picture books at bedtime nearly every night until she was 3 and half, when our fairy loving pre-schooler decided she wanted the first 20 books of the Rainbow Magic series (we had acquired a box set at a nearly new Sale) read aloud to her. Afterwards we continued to read picture books to her nearly every night, and sometimes a chapter book. What we had established from a very early age was that quality time with mum or dad and sharing stories was part of bedtime, and lot’s of happy memories. It was only later that we realised that my daughter had aways been particular about the books she wanted read aloud, and that we had been a bit of luck that we came across in those first few years some stories she loved, but which were also the kind of story that grew with your child. 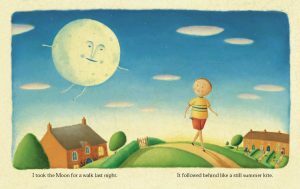 My son as a 1 to 2 year old sometimes enjoyed being read aloud a story with his sister, and in particular our all time favourite family read ‘Who Took the Moon for A Walk’ by Alison Jay. And his fascination with the moon and the night sky probably stems from this time. But, it took him longer to settle to the idea of regular bedtime story. The break through was at 2 and half finding a handful of stories and books which was specific to him. One of which was ‘Bear at Home’. This had a picture of keys on the inside of the front cover and at that point he was obsessed with keys. There was a period of several months I would sit on his bedroom floor and read him a book, and he would look at some of the pictures and then move around the room whilst I kept reading. One really useful thing said to me was that: ‘a child doesn’t have to be sitting still to be listening to a story’. At the age of 4 we gave him a Usbourne Lift the Flap book on Recycling, in theory the book was aimed at 7+ years but he absolutely loved it. He is now 7 and it is still his favourite non-fiction book. When my son was nearly 5 his sister was getting rid of her Rainbow Magic box set, and much to my surprise my son decided he wanted it (he had never shown the slightest interest in fairies). But, he did love numbers, so a set of books with numbers 1 to 20 in a box was a definite attraction. He absolutely loved the 5 books about the weather fairies and was fascinated with the idea that things could get so mixed up that it could snow in summer. 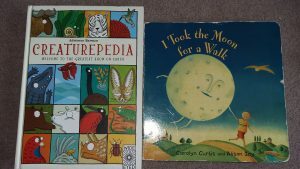 Over the next few years I started to realise that there were certain sort of picture book stories that both my children loved. 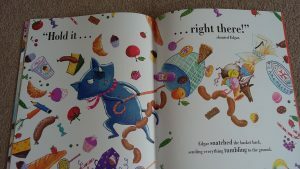 To find book that: ‘lit up the eyes and curiosity of both my children in equal measure ‘ was not as simple as it sounds. But, by a process of trial and error we found a number of books that we all really enjoyed, this was helped by me being an independent bookseller which meant I found and stumbled across all sorts of books I might not have otherwise known about. You can read about some of the books here. TV programmes and Film have also been a good way to introduce my children to stories. For my daughter it was the CBBC drama Hetty Feather, that enabled her to make a giant leap in her reading and got her reading books she wanted to read. See my blog post here. In the Summer of 2016 both my children loved watching the brilliant adaption of the BFG. Then on the way to our family holiday in Wales we listened to the entire audio recording of the BFG, I have never know my children be so quite on a long journey! This winter we went to see a great theatre production of the James and the Giant peach, as a result of which my son wanted the story read aloud to him. Live author events attended as a family have also been an important way to introduce my children to new authors and to keep the magic of stories alive. You can read about a few of them here. We have discovered some chapter books (that were new to both of them) that have made great stories to read aloud. Two of our favourite’s so far are: Dottie Blanket by Wendy Meddour and Perijee and Me by Ross Montgomery. As my children get older our shared reading time is evolving. Last summer my daughter read me some of the Hobbit, which I had always expected would be the other way round! It was one of my favourite stories from childhood. A few months back my daughter took ‘Saving Sophia’ out of the library which she then decided she wanted me to read to her, it turned out to be an action packed story perfect for reading aloud. So this time my daughter was introducing me to a new story. The other weekend we were on our way back from a days biking and my daughter had brought a couple of the Diary of Wimpy Kid books in the Car, my son decided he liked the look of them too, so we had both kids reading a book on the way home. I am not sure where our next shared reading adventures together are going to take us, and as they get older this is a constantly evolving process, but I am looking forward to finding out. Without realising that is what we were doing we have created a family reading culture, with many opportunities for informal book talk. All of which there is much evidence based practice that this helps create children that want to read. However, even in this context neither of my children made an automatic transition to reading independently, nor was or is it automatic that having found books they want to read that the will easily on their own find their next or subsequent reads. To help them find book they want to read they need introducing to a variety of stories, encouragement, support and space to find books that have meaning to them in that particular moment in time. Which has led me to the firm believe that all children both at home and in school should have a basic entitlement to support with reading for pleasure. In terms of motivation to read, one of the biggest difference that both reading aloud and sharing stories has made is that it has given my kids and me added determination to over come any difficulties they have faced and may face in the future on their individual journeys. If you are parent reading this and thinking I wish I had read aloud more to my child or children. My advice would be don’t focus on the past, but start with the present and finding books to share with your child now in a way that works for you and your family. In the 10 years before my daughter was born I worked for Hertfordshire Connexions and Youth Service, mentoring teenagers. One of the most crucial things I learnt from that time, is it is never too late to make a difference, and there are multiple points in a child’s and young persons life in which with the right support they can change direction. The final point I want to add is I don’t think I would have kept reading as much aloud to my children as I have done if I hadn’t found ways to read and/or share stories with both my children. 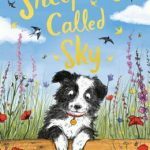 Introducing two wonderful stories which will appeal to children who like to explore the natural world around them and/or are interested in animals. They are aimed at 6 to 9 year olds, but many older children and adults would love them too. 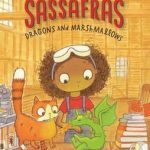 In the summer of 2014, my daughter who had just turned 7 was transitioning to chapter books, and was finding it difficult to find something she wanted to read. She liked animals and was interested in being a vet. However, we found many of the classical animal stories didn’t have enough human interest and other more readily available animal series my daughter quickly lost interest in as she said: ‘they had little plot, nothing really happened in them”. Both these book are distinctively different from many other books with an animal theme for 6 to 9 year olds. They deserve a place in any primary school library, as for some they may be a ‘game changer’, as the book/series that gets them reading. This was a great find I stumbled across whilst looking for something else. 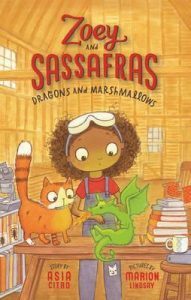 It got my attention initially because I have been keeping an eye out for stories for 6 to 9 year olds, with black protagonists that are the kind of story that might appeal to any child. I had no idea when I ordered a copy of this book what a gem of a story and series it was, published by an innovative fairly new publisher called Innovation Press. 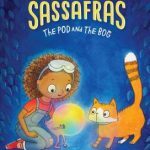 It is about a girl called Zoey and her cat called Sassafras who loves exploring the natural environment near her home. One day she makes an amazing discovery that her mum has the ability to see and speak to magical creatures, and that she has inherited this gift too. If an animal needs help a magical doorbell rings in the Barn next to their house. 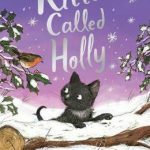 Whilst Zoe’s mum is away at a science conference Zoey and her cat have to help a baby dragon. A beautiful blend of real and magical with an introduction to scientific questioning and hypotheses, this engaging story has plenty to appeal to a variety of readers. Add to this some great role models, from a dark skinned girl with frizzy hair as the main character, a mum who is a scientist and a stay at home dad, and you have a very original story. This is the first book in a series of 4, soon to be 5 books. It is probably a good idea to read book 1 first (or at least read aloud enough p1 to p28), but they can then be read in any order. In case you haven’t guessed from one of my previous posts, my son (who is now 7 years old) is cat crazy, so a story with a cat in is a great start. But, like his sister he is very particular about the books he reads and does prefer stories with a strong narrative and a bit of depth to them, which this story certainly has. One day Jasmine and her friend Tom find an old shed in the garden to play in, and they accidentally come across a wild cat and her kittens. Jasmine’s mum is a vet, from whom she has learns a lot about how to look after animals. So Jasmine and Tom know not to touch the kittens and wait for their mum to return. When the mother cat returned she took the kittens somewhere else. But, later one of the kitten’s gets left behind and Jasmine and her friend help to feed and look after it. But, will Jasmine have to give the Kitten away at the end? You will have to read it to find out! My son loved this story being read aloud to him. 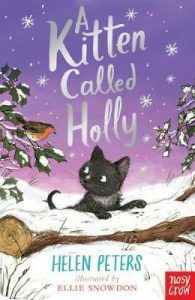 The strong narrative along with detailed and accurate information about how to look after a kitten really kept his interest. He kept asking for one more chapter. With great descriptive detail you feel like you are really there, a story which is heartfelt and sometimes funny. This book is sure to appeal to a variety of children, including those that usually prefer non-fiction. It is part of the Jasmine Green series published by Nosy Crow. This is not the first book in the series, but the characters are introduced well so I think you could read them in any order. I suggest starting with which ever animal your child is most interested in. I love reading a book which strongly resonates with me. This one I picked up at just the right moment. I have my fabulous ‘bookish’ friends on Twitter to thank for recommending it, and for continuing to remind me it existed so I remembered to pick it up. As it happened I had just bought a copy when a Twitter friend of mine posted up a comment and particular page from the book which really got me thinking. 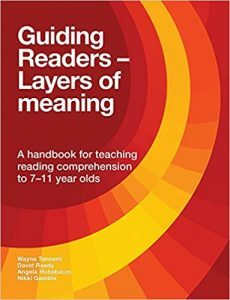 Described as a ‘handbook for teaching reading comprehension to 7 to 11 year olds’, this book is so much more and could be used in a number of ways. I would highly recommend it to anyone including parents (with some knowledge of the reading process) who want to help a child build their reading skills and help them become a reader who wants to read. So much in this book confirms everything I have learnt in the last few years about reading and reading for pleasure. However, there were things that challenged my perception too. It is a very readable book. There was some unfamiliar language but the clear way it is written and the many illustrative examples really helped me to take on what it was saying. I am now going to talk about some of the things that really meant something to me from this book. The first thing that struck me was a reminder of the complexity of the multiple processes which occur when a fluent reader is reading, that allows one to attach meaning to and make sense of a text. It was really helpful to be reminded that as fluent readers we may be unware of what is going on in our heads as we read and reflect on the book. When reading a text, less experienced readers are more likely to be ‘interrupted’ as they use their developing reader skills to make sense of what they are reading. This is something that could affect all readers at different points on their reading journeys. One of the things I have noticed with my own children and some other children is that if a child find’s a text they really connect with it can increase their motivation to overcome these difficulties. In this example the question is ‘authentic’ because the asker doesn’t know which book the children will prefer, and there is also no right or wrong answer. The whole book emphasis’s that encouraging children to reflect on what they read is not about asking them a set of questions to which the teacher already knows the answer. But, in asking them what I would call ‘open questions’ in which there is not one correct answer, but many depending on your viewpoint. That doesn’t mean that some times there isn’t a need for other sorts of questions for example, clarifying ones to check if a child has understood the correct meaning of a word. Given everything I have learnt in the last few years this is something I should have been clear on. However, I have to admit to being very muddles in this respect recently in the way I have been trying to support both my children with their home reading. I now feel slightly better because I now understand why my bright, imaginative, and highly individual children have shown a reluctance to answer the questions that I have been asking them! Applying some of what I had learnt about asking questions to help children develop their ‘reading reflection’ skills I tried something different with my son. He has recently finished reading the 6 book Gold set of the Project X Alien Adventures Series 1 (2). One of the questions I asked was: “Who were the badies?” A question I genuinely did not know the answer to. Which is another point the book makes about co-constructing meaning together. So he told me about some of the badies and then we went through the books together looking for the others and finding in which stories they appeared. Then we started another conversation (prompted by a few of the picture) about how the book used both pictures and language to convey the threat of the arriving baddy or baddies. These included clarifying a few words he was not sure of. He also has an information book about the series. So we looked at the two sidekicks that help the four characters that are the heros and heroines of Project X Aliens Adventures. And we looked at qualities that Seven and Nok had. I then asked: “How have Nok and Seven used their qualities to help defeat the Badies?” He came up with a couple of examples. The conversations we had and the enthusiasm he showed whilst doing it was incomparable to anything I had done with him previously. If you haven’t read this book yet read it! 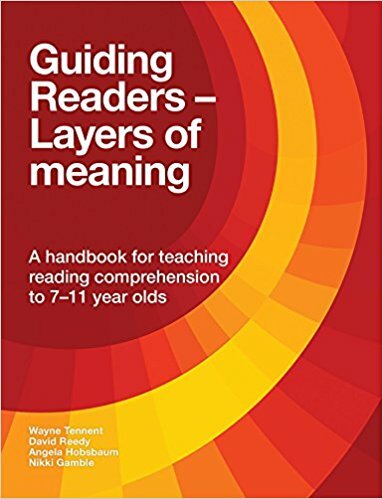 (1) 2016: Wayne Tennent, David Reedy, Angela Hobsbaum, Nikki Gamble: Guiding Readers – Layers of Meaning: A handbook for teaching reading comprehension to 7 to 11 year olds. It is not just a series for boys or reluctant readers. My daughter said that had this been available at her school when she was the same age she would have loved to read it too. Whilst the books can be read in any order. There is a 6 book set for each reading band and if your child reads them (or re-reads them) in order there are more opportunities for building their ‘reflecting reading’ skills. Especially if you have the opportunity to return to them at a later date, which we did because I had bought him a set on his request. 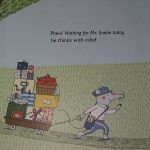 My husband and I have enjoyed reading picture books to our children since they were very little. My daughter took to the idea quickly, whilst it took my son a little longer to get the idea. However, I realised recently that both my children have always been quite particular about which books they liked. 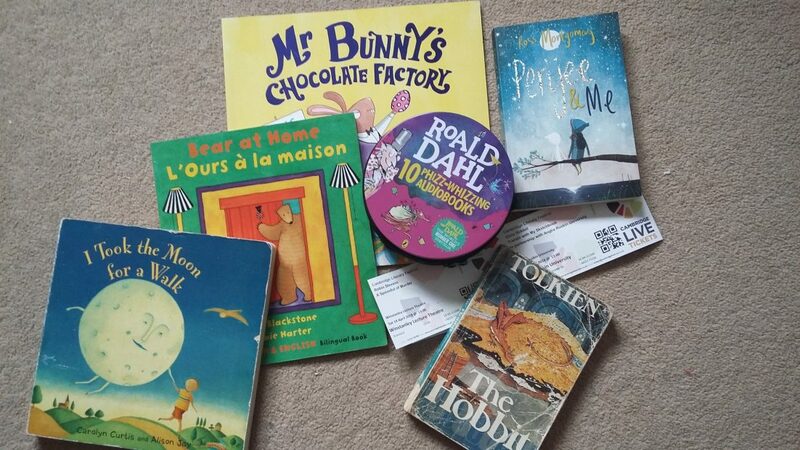 I didn’t initially notice this about my daughter, as her favourite books as a young child were the kind of stories that have plenty more to explore as you get older. With my son we learnt early on that there is a ‘right time’ for some stories, when Wendel and the Robot’s by Chris Riddell sat ignored on his bookshelf for over a year and then became his favourite book for the next 2 years! My kids are now aged 6 and 9 years. I take particular note of any picture books that fully engage both of them, as it takes a special kind of book to do that. 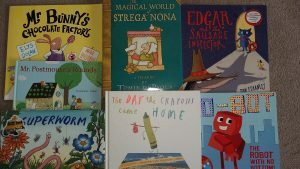 Here are 9 of our favourites, All are great for reading aloud to children of different ages. The rhyming text, and the story of a child taking the moon for a walk make this a real winner. Put, that together with Alison Jay’s picture which are both bold and detailed and you have a story which is truly special. It is a story that flows beautifully, but where there is also lot’s to spot and look at in the pictures. It is one of our favourite of all time picture books, and has probably helped foster my children’s love of the outdoors. 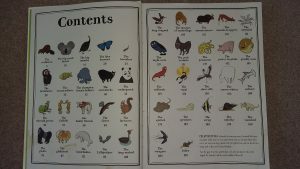 This is a beautifully illustrated animal encyclopaedia for younger children. What set’s it apart from other encyclopaedia’s is the innovative way it organises the Animal Kingdom, and the way it uses both pictures and words in it’s content pages. This means the very young can select which animals they want to learn about by looking at the pictures. The stunning illustrations, clear and concise text and fun way of organising the animals also make this appeal to older children too. My children love taking it turns to choose which group of animals they would like to find out about. This is a simple story. It is about a Robot that looses his bottom and spends the rest of the story trying to find it. There is something endearing about a main character loosing his bottom on a park swing, and it is really amusing when he keeps thinking he has found it! 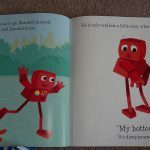 Sue Hendra beautifully captures the emotions of the Robot and his friends that are trying to help him find his bottom. We love the Day the Crayons quit, but we love the sequel even more! It is great to have the story of the crayons continued and developed in book 2. I think this is one of the things my eldest really relates too. 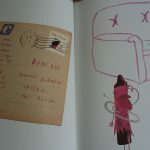 The stories are based on the great idea of a set of crayons which write letters or postcards to their owner Duncan. The story cleverly captures the emotions of the crayons and there are also different levels on which to relate to the story, which make it a great read aloud for children of different ages. 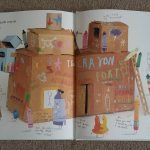 On the last page there is a cardboard fort which Duncan has built for his crayons. My kids love identifying the different crayons and working out why they are shown like that and/or if their needs have been met. On one occasion it even inspired my children to make their own crayon forts! I only discovered this book because of the research I was doing into picture books as an indepedent seller of children’s books. I am so glad I did, as it’s such a unique book. The journey narrative is really important in keeping the listeners interested. We have had fun trying to remember which animal the postman is visiting next. The illustrations are great and provide plenty of detail to look at, talk about and things to count. 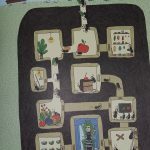 We especially like that the animals homes are drawn as cross sections, and that you can make connections within the picture, whether it’s how the bear get’s to feed himself honey, how the crocodile heats his eggs or that the Magpie is a wanted bird for something that he is has hoarded in his nest. This is the additional story that only the pictures tell. 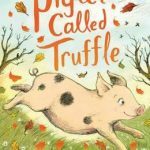 This is one of our new favourites which was published earlier this year, and which both my children love. Jan Fearnley is both author and illustrator. 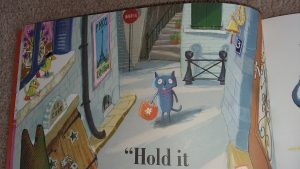 The story is about a cat called Edgar who every time he goes shopping bumps into the Inspector, who takes Edgar’s food claiming it has gone bad. Finally Edgar has had enough and it is great when he stands up to the Inspector. With a modern day freshness the illustrations capture the same magic as my daughters favourite stories as a young child by Clare Beaton and Alison Jay, but in a story that is aimed at older children. Jan Fearnley creates pictures that are bold and eye catching and which capture the journey and narrative well, and that have lots of detail to explore too. Including lot’s of food you want to pick right off the page! This is a wonderful catchy, rhyming story, which is the kind of story Julia Donaldson is popular for. It is about a worm who helps all his fellow insects, but one day he is captured by an evil wizard and his friends come up with a plan to rescue him. 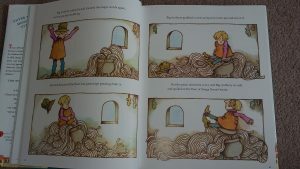 Axel Scheffler’s illustrations are spot on and brilliantly capture the worm and his relationship with the other insects. 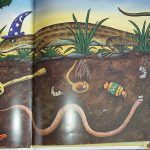 We especially like the cross-section picture of the worm underground trying to find treasure for the wizard. The way Superworm is rescued by his friends is pretty cool too! My son has been crazy about all things recycling since he was 3 years old, So for him the fact that the wizard is thrown in a rubbish dump is a great addition to the story and he loves identifying the different things you can find in the tip. Another new favourite which was published this year, is by talented debut author and illustrator Elys Dolan. 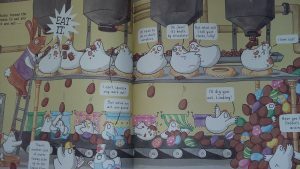 This story is based on such a great idea of a factory run by Mr Bunny, which produces chocolate egg’s that are laid by chickens. 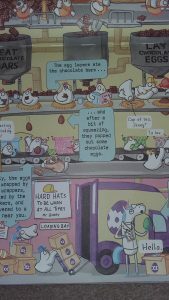 The detailed pictures of how the factory actually works really grabbed my kids attention.They love working out how the different parts are interconnected and what is about to go wrong. In the story Mr Bunny get’s greedy and makes some not so wise changes to produce even more eggs. This provides a great double layer to the story, of before and after, where my kids love comparing the two. It also prompted them to suggest some solutions of their own of what the chickens could do to deal with the increasing stock pile of eggs. I have a feeling we will be enjoying this book for many more years to come. 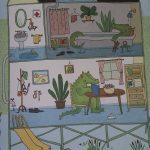 This beautifully illustrated story is an Italian twist on the traditional story of the Magic Porridge Pot, which is also one of my son’s favourite stories. Strega Nona, translates as “Grandma Witch’. The story is about an old woman who has a magic touch in healing people. One day she decides to go over the mountain to visit her friend and leaves her helper a young lad called Big Anthony in charge. He can not resist using Strega Nona’s magic pot, which magically produces something. Can you guess (what are the Italians famous for?) Spaghetti of course! However Anthony fails to overhear what Strega Nona does to stops the magic pot. Both my kids love it when the spaghetti starts to spread out of the pot and down the road of the village! Strega Nona arrives back in the nick of time. Some of the pages have beautifully illustrated sequences that help tell the story. As we have Italian relatives we also like that this tale sneeks in a few Italian words. One of the wonderful things about being a parent is seeing your children grow in confidence, you don’t always notice the small changes, but when all those small changes add up to a bigger change you do. One of the things my nearly 9 year old has grown in confidence in is her reading. This includes her confidence that she will find another book she likes and her increasing ability to accurately choose books she does like. Both are essential skills in reading for pleasure: a belief that there are stories out there you will love and, the ability to find them. It has been a two year journey to get to where she is now. It is only as she moves into a new phase in her reading that I realise just how far we have come. I say we, because in parallel to her journey I have re-discovered a love of fiction, after reading mainly non-fiction for 10 years. I have discovered I much prefer reading children’s fiction, to adult fiction, and that I especially like middle grade fiction! My daughter and I have, over the last two years, both become readers. 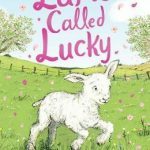 We have discovered authors we had never heard of two years ago, and that there is so much more variety in children’s chapter book fiction than we could have possibly imagined. Yet, what is interesting is that until a month ago, there weren’t any books I had read or suggested to her that she had picked up and read. We have read different middle grade stories. As an indepedent bookseller I was initially interested in reading children’s books, so I could tell my customers about them. But, then I quickly realised I was picking stories out of my selections that I really wanted to read. Through becoming a reader myself I have a new understanding of what it takes to become a child who wants to read. Most importantly I realise that becoming a person who wants to read is not a linear journey. It is instead a dynamic process with up and downs. I have also discovered that there a multiple routes to becoming a reader, and for many children (adults) this is something that has to be worked at. It was about two years ago this month, that my daughter discovered the first book she loved reading for herself. That story was Hetty Feather by Jacqueline Wilson, and was very important in getting her reading. You can read about it in my blog post. However, as we were to discover that was just the start of her journey towards reading for pleasure. Along the way there are many things and people that have helped. My decision last May to book us into our first live author events at the Linton Book Festival was one of them, and I will be talking about this in my next blog post. We hope that by sharing some of the things that helped us, that more people will realise there are many ways to becoming a reader and that you may find out something that will help a child you know, in their journey to becoming a reader. In this post I tell the story of how my daughter became a reader. She is a bright child who has loved picture books since she was 10 months old, but her transition into reading chapter books was not straightforward. I believe some of the factors which made it a bumpy ride may be relevant to other children of all abilities. We hope sharing our story will help other parents and educators support their children. About a month before her 7th birthday my daughter was considered to have reached a good competence in her reading. This meant that she could now ‘choose’ what she read, first from books that bridge the gap between school readers and chapters books and later chapter books. It may be relevant to note that this is done earlier in my daughters school than in other schools, with the idea if you have choice about what you read you will be more enthusiastic. At first this seemed to work, and she enjoyed the books she brought home. However, quickly she said she could not find a book she liked. At that time the schools selection of early reader’s and first chapter books was poor. With the knowledge and experience of fiction for 6 to 12 year olds that I have acquired in the past 13 months I now realise just how ‘limited’ the choice of books was. As a growing school the funding for new books did not come through until 6 months after she had made this transition. Choice matters and lack of choice did make that journey more difficult. However, we did by an unexpected routes get there in the end. This experience inspired me and my daughter to find out more about children’s fiction. We have learnt that engagement (and disengagement) with reading is a fluid process, and that there are more great books out there than I could have possibly imagined! So you can choose what you want to read? So finding the something you want to read will be easy? We found it wasn’t quite that simple! What if the kind of story you liked to be read isn’t the kind of story you want to read yourself? What happens if the books your friends are reading don’t interest you? What if some of your friends are at a different stage of reading so not reading chapter books yet? What if your comprehension of language and story structure is great than your reading ability at that time? All of these things put together certainly add to the task of finding the right story. A good librarian can help, but, even with the help of our local library we still felt like we were guessing. My daughter often learns by ‘doing’, so maybe the only way to find out what books she liked was trial and error. Many of the books were quickly rejected. It was quite a bewildering time as a parent. My daughter went in a few months from being enthusiastic about reading to beginning to loose interest altogether. I remember talking to a friend who had a daughter a year older . She said “there was a period where her reading seemed to stand still, but she is enjoying reading now”. So maybe this is a phase that lot’s of children go through? It was a reassuring to know. But, something was telling me that wasn’t quite the whole story. Then two things happened, One was we started having conversations about the books she has rejected, the ones’s she would not read and the ones she got half way through. The quotes below are written with hindsight and may not have been as clear at time, but the suggestion was there. The second thing which happened was my daughter was loving a new CBBC drama, called Hetty Feather based on the book by Jacqueline Wilson. Through which she became fascinated by the character Hetty Feather and the Victorian era. She liked it so much that she re-watched it many times. She got all 4 of the Hetty Feather stories from her grandad on her 7th birthday, along with an Victorian outfit. The look of joy on her face was priceless. We then shared reading Hetty Feather. My daughter would read a little, then myself or my husband would read some more of the story. This suggestion was made by another parent and it worked really well. The fact that she could already identify with the main character from watching the TV drama helped in wanting to read the story. Familiarity with the story helped her to access a book that was a little above her reading level. Finding that first book a child enjoys reading is so important. We now know she could read a book with a complex plot and that she could find a book she wanted to read, neither of which should be underestimated. It was however, only the start of our journey into establishing the foundations for reading for pleasure. I’ve heard some parents say “once they found that one book they were of reading.” In our experience it wasn’t quite that simple! Reading pebbles is the name I have called my blog because it brings together two things I am passionate about children’s books and nature. I am particularly interested in how we can help every child to love books and reading and, ways we can re-connect children and adults with nature. It occurred to me that comparing a pebble with a reader could be an interesting analogy to consider. So here are some comparisons. A pebble is a small round stone. You can be hold one in the palm of your hand. Books are rectangular with straight sides,most cannot be held in the palm of your hand. But, the experience of reading you can take with you. Books can foster curiosity and imagination. This together with the meaning and understanding the reader takes from the story you can carry with you. A pebble began its life as a large piece of rock, and its journey to becoming a pebble can be a long one. It is constantly re-shaping and reforming as it goes. When you read a good story you can feel like you have been on a journey to real or imagined places (sometimes both!). The process of becoming a competent enthusiastic reader is a ‘fluid’ one, it may have its twists and turns, rather like a piece of rock bumping along a river bed! To understand how a pebble has become what it is, we need knowledge about the factors, which have shaped it. Two are particularly important: Firstly, the type of rock. Different type of rocks will erode at different speeds and in different ways. Secondly, several environmental factors interact to break rock into smaller pieces and then smooth the edges into a round stone. These include: rain, wind, waves and sand. Could this analogy be used to consider a reader? Let’s have a go. Firstly, there is what a child brings with them in terms of life experience and individual reading skills. In this scenario this could be the ‘type of rock’. Secondly, there is the environment in which a child experiences books and reading, I am going to call this the ‘book environment’. I am particular interested in the encouragement of life long readers so imagine in this scenario that the child is aged 6 or more years. The ‘book environment’ is two fold. There is the book itself. Then there is the wider environment, which includes: access to books, knowledge about them and others perceptions (parents, school and society) which can directly or indirectly encourage or discourage a reader. For me using a natural system as a lense to view a complex human process has been useful. I hope your found it interesting. From this viewpoint you can start to ask all sorts of interesting questions. One of which I will consider in my next post.